For the competence of the mastery of a language, there is a so-called reference standard. This ranges from a few skills (A1) to excellent end levels (C2). Standard B2 must be reached for the application in Germany. An examination must be made. BNAC offers German Language to every applicant who wishes to learn German as part of their requirement before going to German. Those already proficient in English WILL NOT have a hard time learning German since both languages are from the same family. Learning German language is valuable for your career if you wish to work in Germany. Our teachers are German nationals that will help you to understand words, correct pronunciation, translate and interpret sentences and situation. They can speak English fluently so nothing to worry because they can explain everything well. BNAC constantly provides information sessions for working in Germany. At the following address data are available. BNAC (Philippines) provides a range of academic options for International Students to study in New Zealand, Europe and qualify to apply for residency upon graduation. We offer a wide selection of courses with accredited educational institutions in New Zealand and Europe for academic, professional, and vocational studies. The new partner in teaching languages is one of the highly-qualified schools in Manila. Opposite the German Embassy and with small classes wid there from A1 to B2 taught. • participation in general school supportive learning activities. • German movies and games nights. 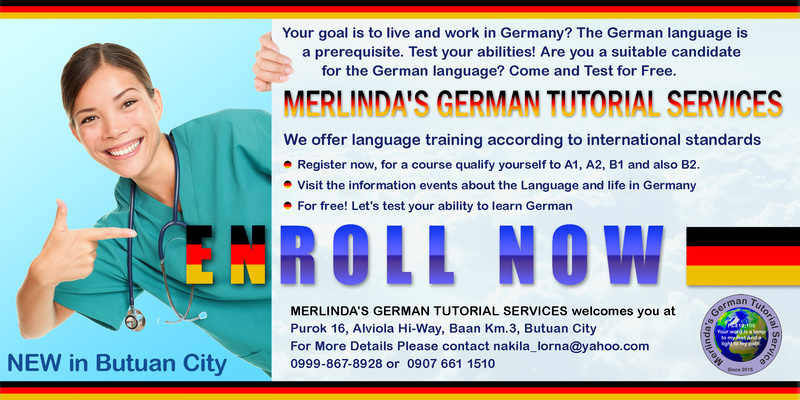 If you are looking for a language School in Butuan City, Mindanao, Merlinda will help you. The new school has just been finished to accommodate students. Sign up or come to the test of your language abilities.